Florida Strawberry Festival Announces Theme! Hey everyone! Travis here with an announcement about one of the best Tampa Bay area events throughout the year! It&apos;s the Florida Strawberry Festival, and I hope you are as excited as I am. It&apos;s almost time to "Come Celebrate With Us!" The 75th annual (Diamond) anniversary Festival will take place March 4-14, 2010. The Festival has chosen the theme "Come Celebrate With Us!" which depicts what the Festival is, celebrating the harvest of the strawberry and everything that goes with it. The artwork for the 2010 Festival is a combination of Balloons, Diamonds and Top Hat all incorporated with Strawberries. The 75th anniversary edition will feature 24 headline acts on the GTE Federal Credit Union Soundstage that is sure to be as sharp as the edge on a diamond. In addition, the Festival includes a huge assortment of free-family oriented acts daily, over 80 rides on the Belle City Amusements Midway, almost 400 vendors, exhibitors and food concessions and offers special days and discounts. The Festival has teamed up again with Sweetbay Supermarket and will continue to make available the advance discount admission tickets at select locations starting in early February and will remain on sale at the advance ticket price during the 11 day celebration. 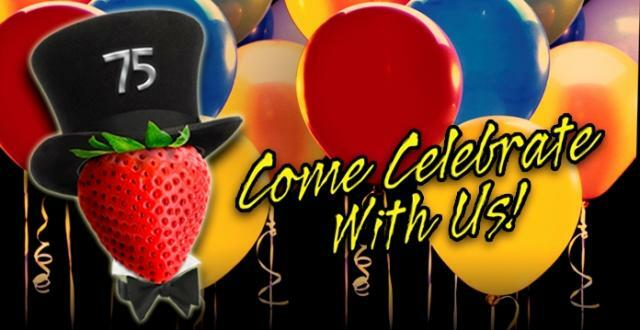 Make plans now and mark your calendars for the 75th annual anniversary Florida Strawberry Festival, March 4-14, 2010 and "Come Celebrate With Us!" in beautiful Plant City. If you are looking for more info, just visit their website at www.flstrawberryfestival.com. And of course, we&apos;ll be bringing you updates about this event over the next couple of months, so stay tuned! And we&apos;ll still be bringing you updates about other great things to do in Tampa Bay and other Tampa Bay entertainment options.